Paris was never a city I thought of visiting. A perception had been ingrained in me — of an always overcloud sky, the majority of French folk who didn’t like Americans, a bit unsafe, expensive, and overwhelming. Last October I was in my Saturday “waffles and email catchup” routine when I noticed a subject line, “Unheard of Fares From Minneapolis” — pure click bait, that of which I clicked. And saw roundtrip tickets to Paris for $410. We spent five minutes making sure our schedules were free in March and promptly booked, albeit, still with a little hesitation. Neither of us knew a lick of French, but I just kept telling myself there was always google translate. Being that the internet has connected me with people located around the world, one of my peers mentioned she’d stayed in the flat you see above, this AirBnB listing, and it looked perfect – had a kitchen, was in a central location, great price, clean, and modern. I booked immediately, as to not lose something that almost seemed to good to be true. Also, click here for $40 off your first Air Bnb stay! And that was about all the planning I did. 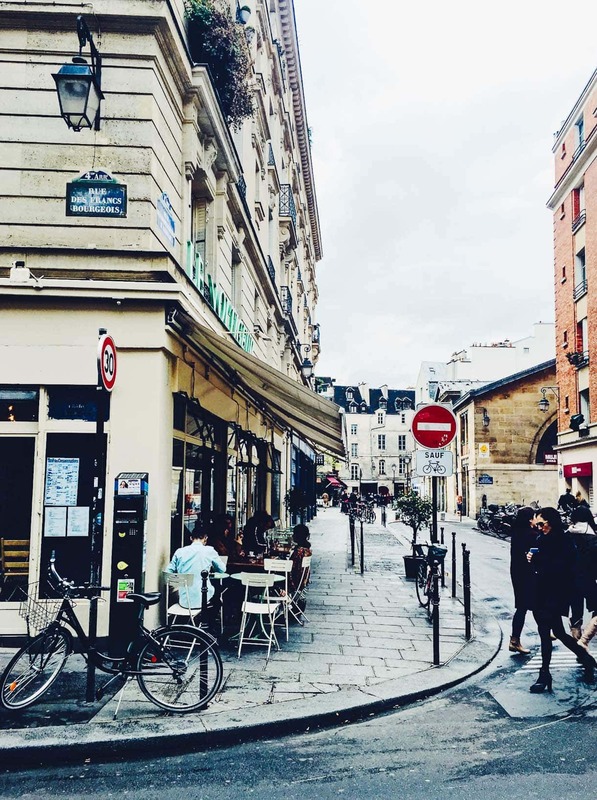 (Besides talking to Olaiya for a few recommendations since she visits Paris several times a year, and knows the local vibe.) Partly because every time I seemed to research online, I was overwhelmed with all of the information and didn’t really know what to trust. Partly because I didn’t want us to feel pressured to get everything in and be so focused on checking things off a list that we’d lose sight of enjoying our time. And you know what? I think the unplanning is the reason I fell in love with this incredible city. We walked (everywhere), and talked, and gazed. Around every corner there was a building older than our country. Down every street there was the beauty of cobblestone walls, and small balconies with flowers hanging from them, and often a person taking in the moment. We observed, and we participated. The French language is so beautiful, it hurts – knowing how choppy we sound as Americans. After being there just a few hours, it was obvious that being able to speak even just a few phrases were incredible signs of respect to locals, and a little could go a long way. So we did our best. Perhaps one of the things I was most moved by was their communication. Simply put, phones were obsolete when people were with one another. Whether that be a bar, restaurant, coffee shop – I literally never ever saw someone with their head buried in a device. They were solely focused on the conversation, the moment. What a wake-up call to the lost beauty of personal connection here in the United States. And by the end of our 8 day stay, all the perceptions I had of Paris were completely diminished. In fact, the exact opposite. This city is sincerely magical, and different, and unique, and beautiful – even on its gray days. 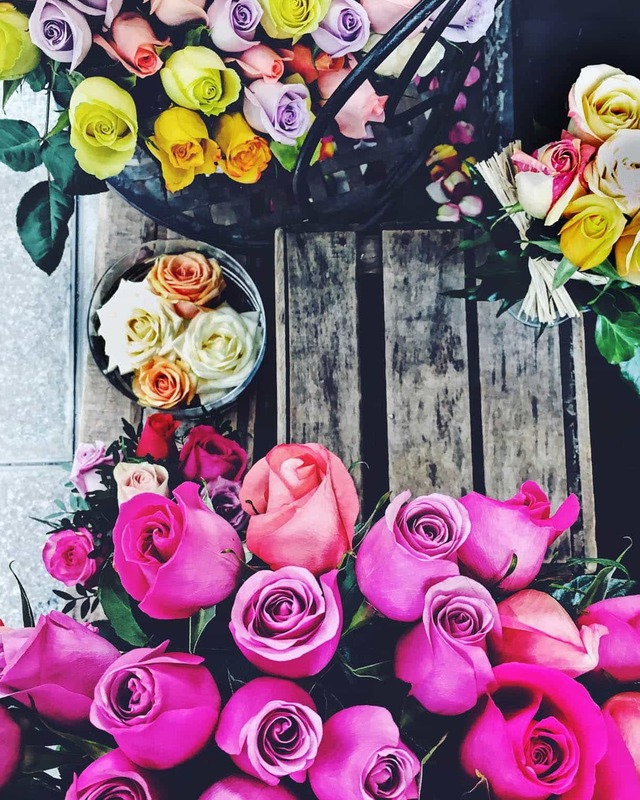 Its allure lies not just in the sights, but the subtle aromas, textures, colors and romance in the air. And somehow it balances grand history with the now. Flying back, my heart felt so incredibly full. So grateful to see more of our world. So grateful to have the memories. To which I’ll leave you with this one last piece of advice about traveling…. 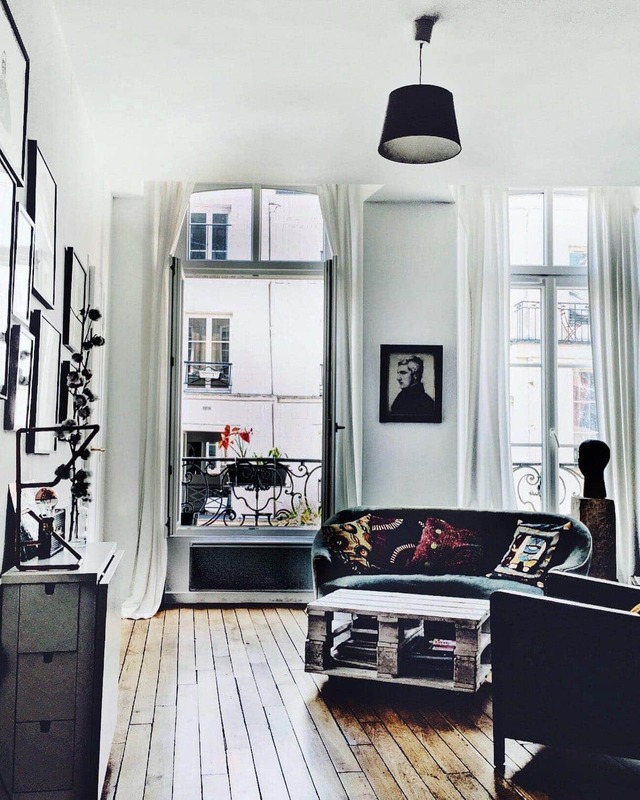 even if you’re intimidated, feel too busy, or are thinking about the expense, one thing is for sure — you will never regret the space it will fill in your life. Okay, so here are some of my recommendations and tips. Most of these things whether they be places or food, we stumbled upon, or we learned about from some of our favorite people we met along the way. Most Parisians don’t eat dinner until 8:30 or 9pm. Which actually played into our favor because reservations were typically always open around 7:30pm. Learn several French phrases, as it goes incredibly far in the respect and help you will receive. Most importantly always say “Please” before asking for something. Take a taxi from the airport, then Uber on the way back. It’s hard to figure out the Uber spots inside the airport. Be patient and expect to wait, at all places, for all things. This is just how life goes here, whereas we always expect things immediately. Don’t pack a lot of clothes if you are going in February-March because the weather doesn’t waver much from overcast and 50 degrees. A few pairs of leggings, sweater dresses, coat, boots, comfortable walking shoes, and you’re set. You’ll be covered up most of the time walking, and even when in restaurants, the feel is super cozy. I didn’t bring my big camera, and was so glad I wasn’t lugging it around. All of these photos were taken on my iphone 6s. 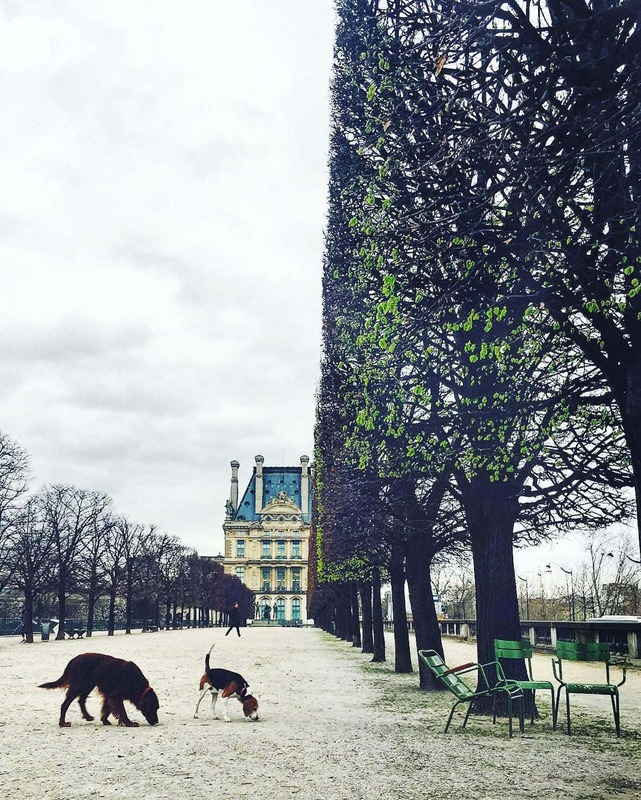 Our favorite places we stumbled on, most of what you see pictured in this post: Luxemborg Jardins, Eiffel Tower (climb the stairs to the second level to skip the crowds), walking through the Louvre (not actually going inside the museum, just walking the grounds is amazing), Jardin Des Tuileries, Merci (Ikea meets Crate and Barrel), Le Marias, walking along the river, and any hidden street you can find. 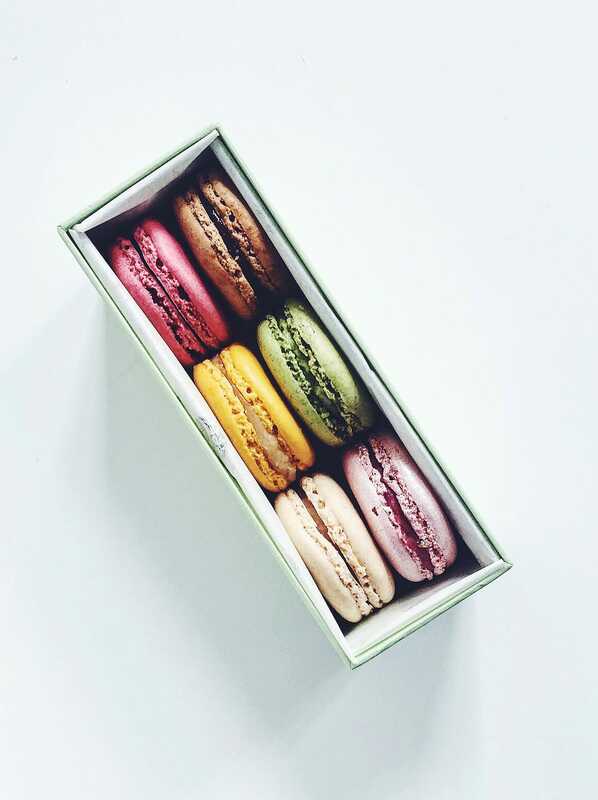 Lauderee Macarons: Yes, you can find a macaron at any patisserie in Paris, but these – these- are the best. Delicate, with the perfect crunch and collapse to sweet fillings of all your favorite things. I spent way more time picking out these six flavors than we did eating them! The red fruits with champagne was stellar. Berthillon Ice Cream: Nested in a small neighborhood close to Notre Dame, this historic ice cream parlor won my heart. Incredibly smooth, just sweet enough, and flavors that change with the seasons. The scoops are small, which I loved, so I could try two — Fig and Honey Nougat. Make sure to bring cash, as that is all they accept. Jacques Genin: An amazing chocolatier, but an even more amazing maker of fruit de pate. If you’ve never had these before, imagine biting into a soft gummy candy version of your favorite fruit with a light sugar coating, the most intense representation of it. 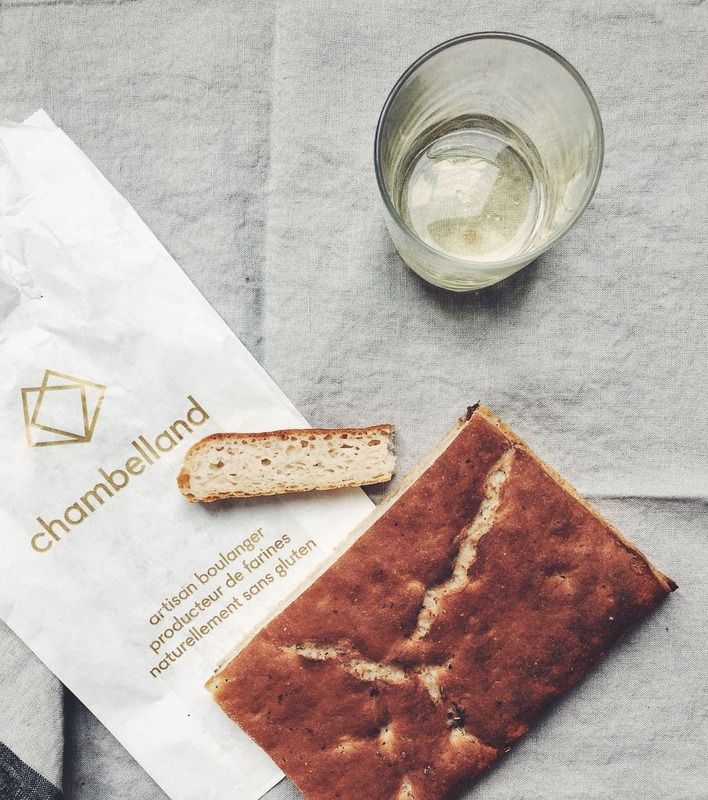 Chambelland Gluten-Free Bakery: I’ve never tasted gluten-free bread this good. Ever. And everything is naturally GF, made without gums! Fascinating. Over the course of 8 days, I went 3 times. :) The focaccia was perfect for snacking on with cheese, the seeded bread for breakfast, and the cookies, especially the brownie cookie, were incredible. Holybelly: You’ll wait in line no matter what time you go, but it is worth every second. The (relatively healthy) menu changes every month, but their classic egg dishes stay, and some riff on their savory pancakes with fried eggs and bacon. The coffee is also wonderful. 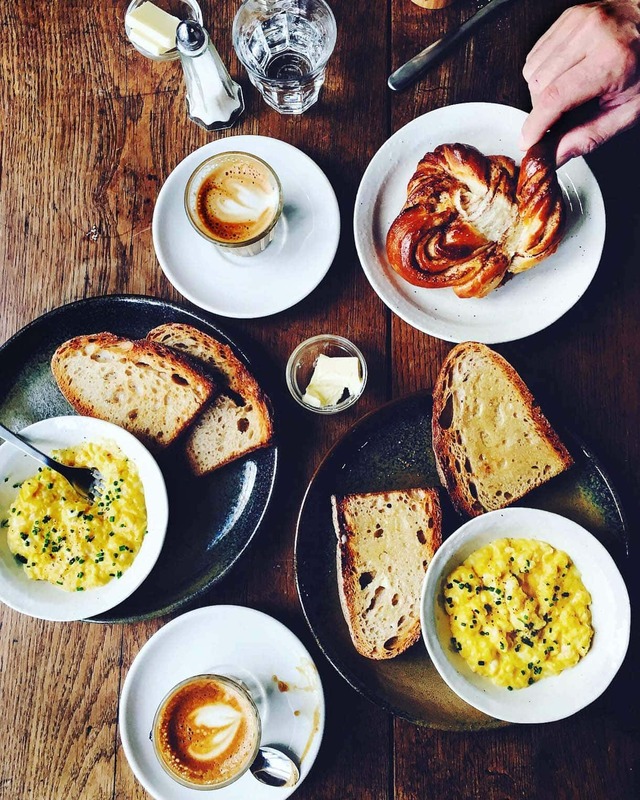 Fragments: A very small and quaint coffeeshop that happens to make everything on their small menu in-house, including the creamiest soft scrambled eggs I’ve ever had and sourdough bread. 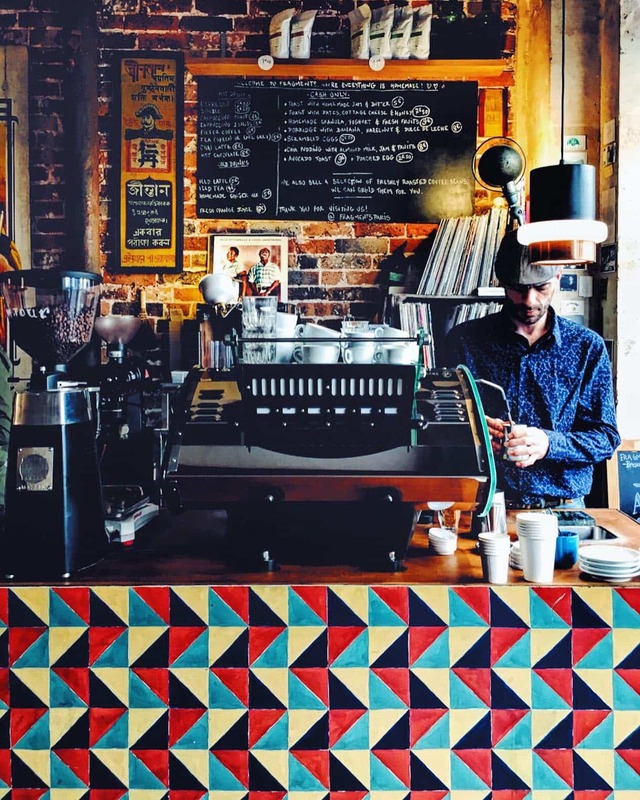 They spin vinyls, and brew locally sourced coffee/espresso as well. 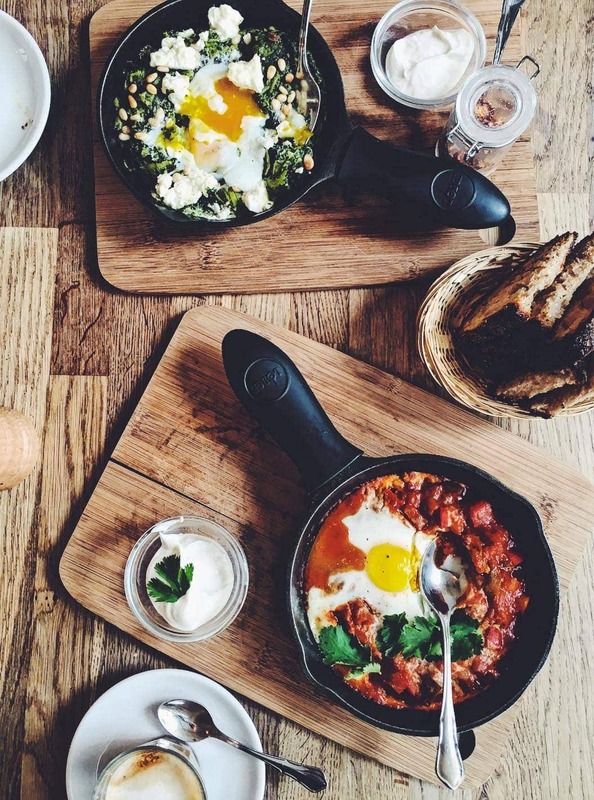 Café Oberkampf: They’re known for their shakshuka (both red and green! ), as well as different variations of toast. The coffee was excellent, and this spot is close to Chambelland Bakery so you can hit them both at the same time. Wild & The Moon: Think Moon Juice here in the US. Super healthy, natural, organic, raw, sprouted, adaptogenic you name it. Expensive but delicious. And a very cool vibe. The Coconut Almond Latte was soooooo good. Ob-La-Di Cafe: Cute and cozy coffee shop, somewhat tucked away, that serves a small breakfast menu. 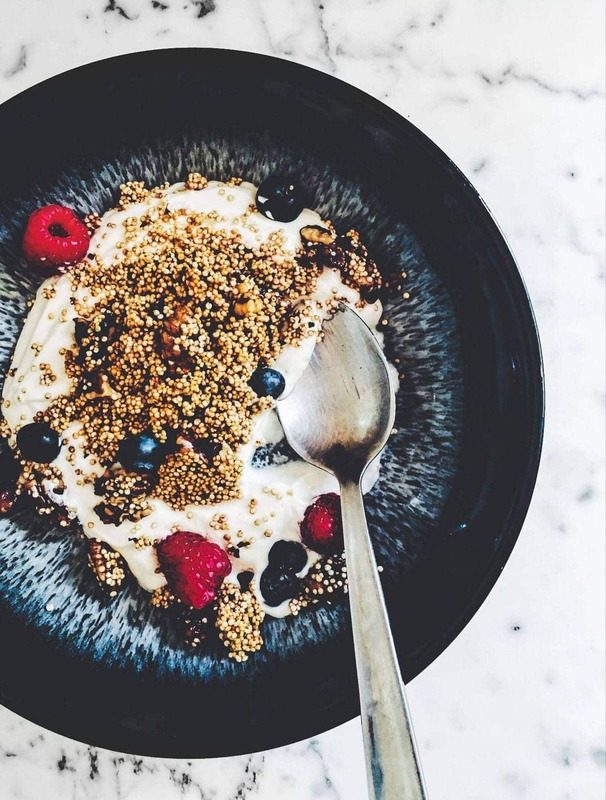 Brian had the avocado toast and I had the whole milk yogurt with fresh berries and housemade quinoa fig granola. Stellar. Jones: Small to large plates, all locally sourced, and very inventive. The waitress was very kind and translated the entire menu for us. Funky, romantic vibe. Also has a nice little bar. Au Passage: Another place where the locals go. This was my favorite dinner of the trip. All small plates featuring nose to tail and root to stem cooking. The menu changes nearly every week! We nearly licked each one of our plates clean. Rice and Fish: This spot is so tiny, easy to miss, but has some amazing sushi and noodle dishes. They use fish flown in daily, and everything is made to order. We got this for take out night and it was absolutely perfect. Big Fernand: Yes, I’m recommending a burger place. Holy wow, these were incredibly juicy and the paprika thin cut fries uh-mazing. It’s not fancy, more like Five Guys style, and totally worth seeking out. 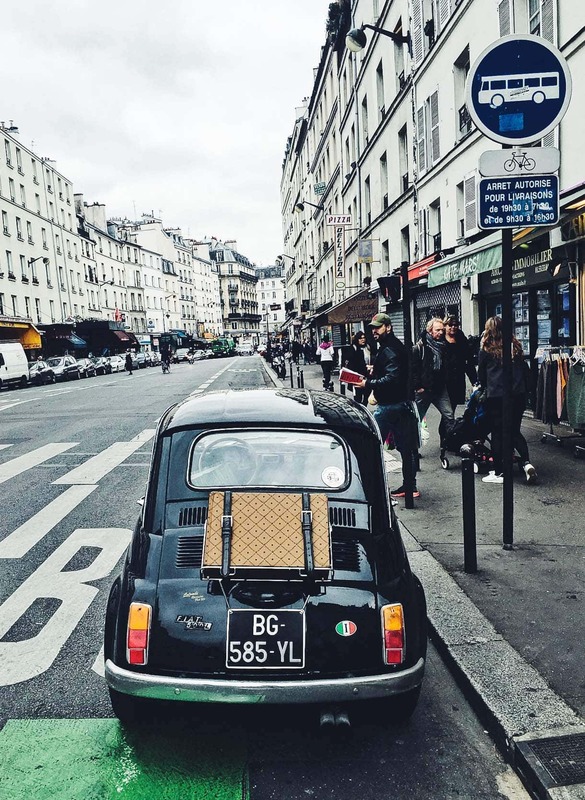 Au revoir, Paris…. I’ll be back. I enjoyed every second of this post! 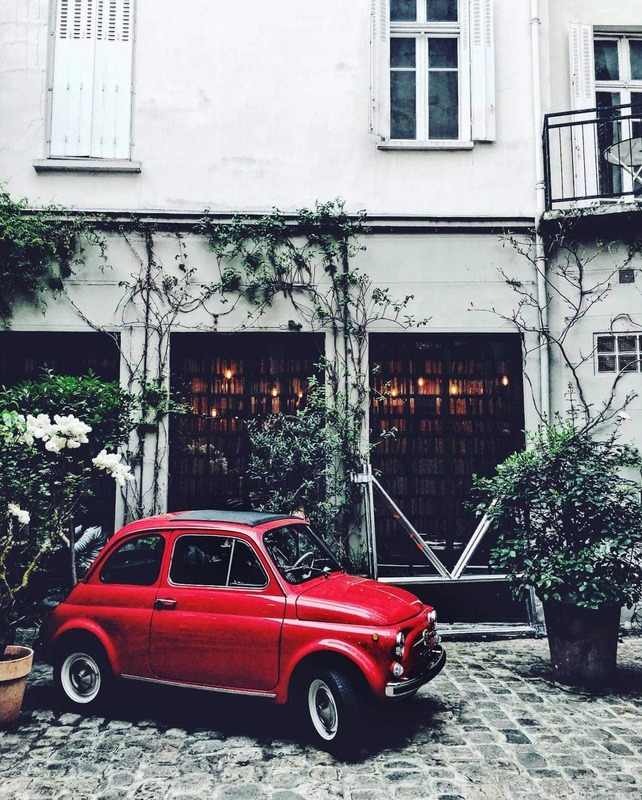 I dream of Paris someday and it’s so much nicer to know that it’s best unplanned! I love that nobody has a device in front of them. It seems almost magical! I’ll be tucking this article away for when I DO get the chance to go!! What a wonderful recap of your trip. Albeit, I’m sure words will never do the experience justice for you…it looks so magical. 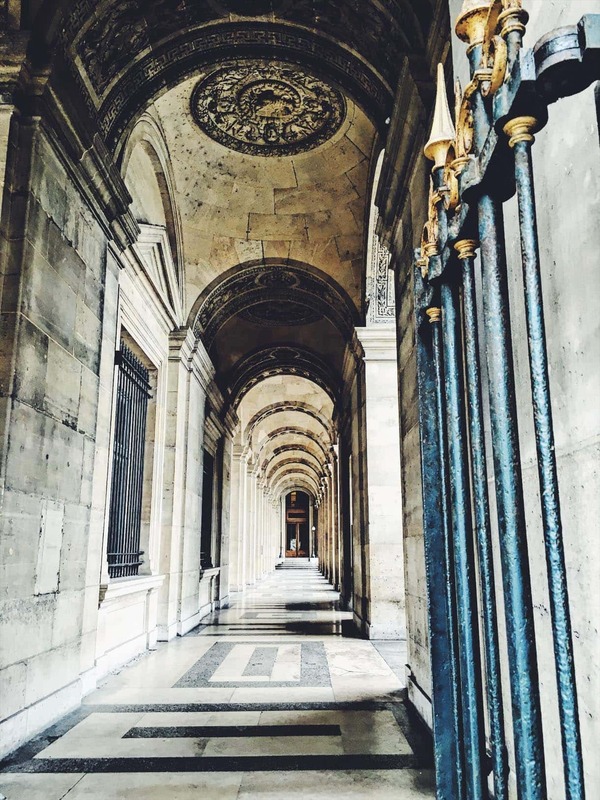 You’re photos are beautiful and capture what I think of Paris…I’ve never been, but it’s on our list! Gorgeous photos and wonderful tips! The taxi/uber tip for the airport is simply brilliant. I’m so inclined to automatically calling Uber & I have struggled with location them at the airport. No idea why I never thought of this! The waiting tip, also very true & helpful. We have become way too impatient. When my son was there for school he learned and taught me that the Europeans feel it rude to automatically give you the bill at a restaurant, you have to ask. Even though I know this I sometimes forget, being so used to being rushed out the door! This really makes me Want to go back. That Airbnb looks absolutely dreamy! Thanks for sharing! This just convinced me to book a trip to Paris! Sounds like the most magical vacation, and your recommendations were lovely. Thank you! I am a newcomer to your blog. 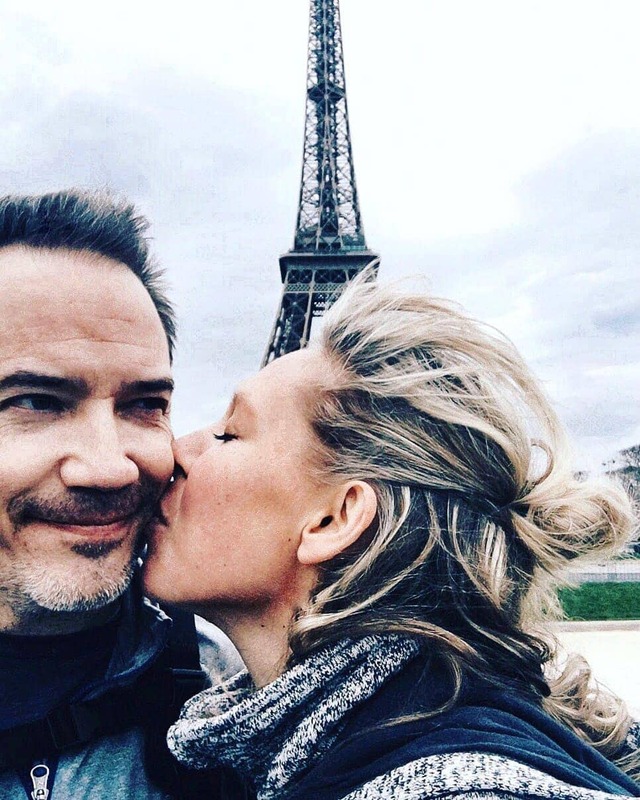 I have Celiac disease and I am wondering if you felt that it was easy to do gluten free in Paris? The bakery sounds incredible. But, is it easy to do in general? Thanks! Your trip looks wonderful! Hi Sarah! 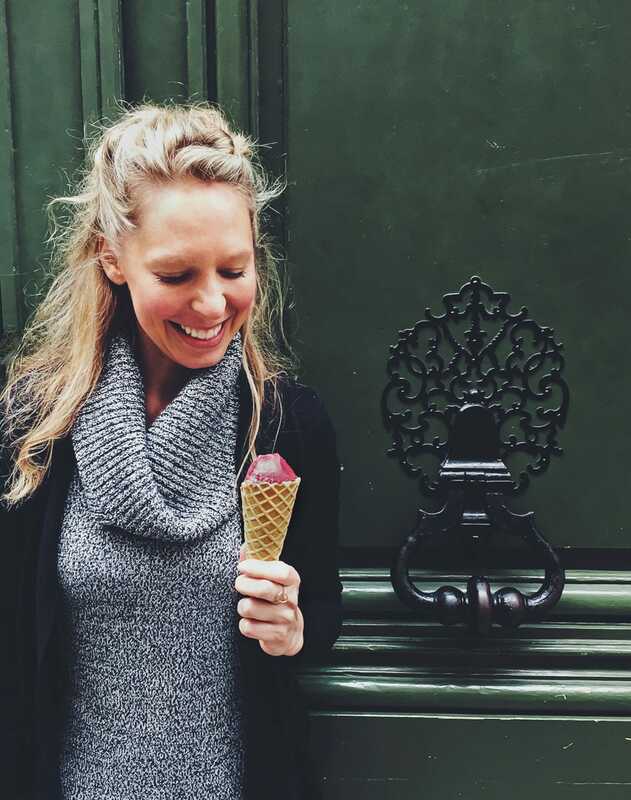 Eating gluten-free in Paris is just like it is here in the US. There are definitely restaurants that are GF only (like Wild and Moon), and I was able to find something at every single place we went. I don’t have celiac, mine is an allergy, so it might have been easier for me, but as I said there are several GF designated restaurants, including that bakery. You can tell most of the servers your issue, and most will be able to help you. I wouldn’t let it hold you back from going! I love your “no pressure” approach to visiting Paris. And you’re so right about phones being absent at restaurants and cafes. That’s one of my favorite things about the city–real human connection. (That and all the amazing food!) I’m so glad you enjoyed your trip. The “no pressure” thing seems to even be a way of life around Paris. Even though there are so many people, I felt like the culture is way less rushed and over-committed, in general. The hustle and bustle was of a different type, one that didn’t make you feel anxious. Completely the opposite of New York City. I love this post! I’m glad you guys had such a great time there. That airbnb looks soooo dreamy. I’ll need to remember that if we ever get back to this gorgeous city. That photo of the two dogs in the park blows my mind every time I see it because it looks SO much like my dog hanging out with my brother’s dog. Super weird. Yay for Paris! If I were to trust one person with Paris recommendations it’d be, Olaiya. And now, you too. All good things are wild and free, babe. I’m happy this trip to Paris with Brian made you happy. Love you lots. It’s been 11 years since I went and rented an apartment above Berthillon on Isle de Sant Luis for a month. Creating a wall Mosaic with a representation Berthillon in it so as I was researching ran across your blog. I made my plans daily as I had my coffee and brioche. An incredible experience loved every single day! You have reminded me I have to go back! 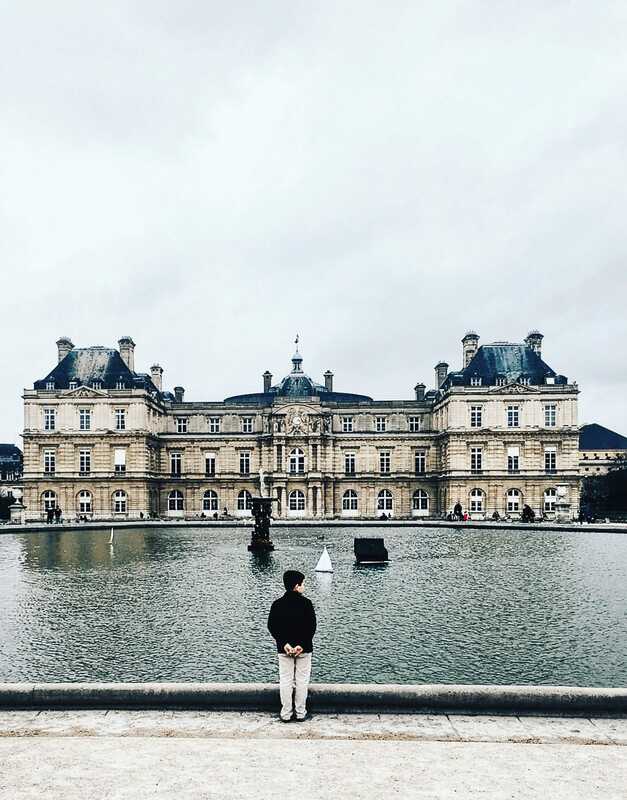 I love that you captured Paris so well considering that it was your first trip there. I am in Paris quite often, but it’s always fun to read what other people find wonderful about Paris. I just booked dinner at Au Passage for next week! Thanks for reading, Julia! How fun that you are in Paris often, I’m jealous! 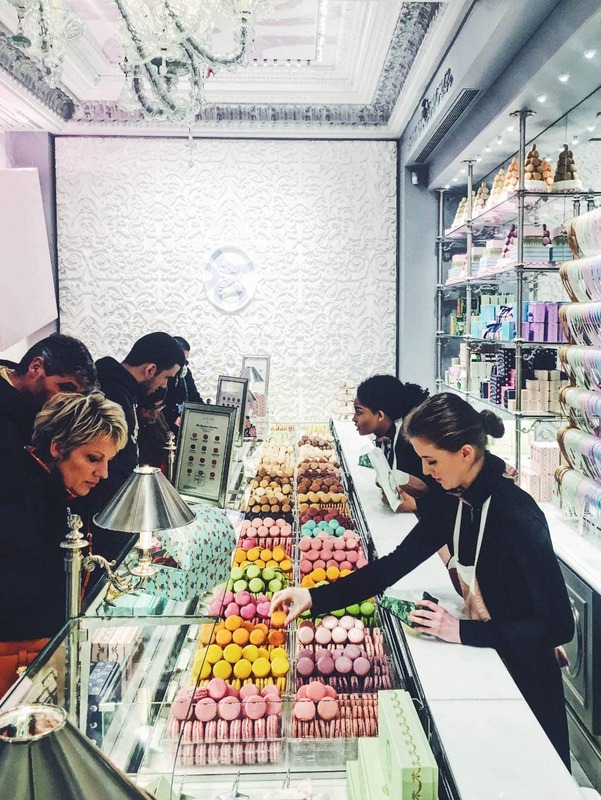 Enjoy Au Passage – it’s fabulous.